At 9 a.m. this morning, look for a crowd to gather at the block bounded by Foster, Corporation, Morris and Geer Streets, as the venerable old Durham Athletic Park project breaks ground. Local residents as well as the media are invited to see Mayor Bell, city manager Patrick Baker, and Minor League Baseball CEO Pat O'Conner turn shovels with NCCU chancellor Charlie Nelms and Capitol Broadcasting head Jim Goodmon. Retired from use by the Durham Bulls since 1994, the park has continued in a new life as the home for events like the Bull Durham Blues Festival, World Beer Festival, and as a ballpark for Durham School of the Arts. But the ballpark has been showing its years of late, with peeling paint and outdated facilities limiting the attractiveness and usefulness of one of Durham's true historic places. In 2005, Durham voters approved a $4 million bond issue to renovate the DAP; the City brought in Struever Bros. Eccles & Rouse to evaluate the park and to understand its future uses. At the same time, Durham worked to strike up a partnership with Minor League Baseball, which was interested in using the DAP as a training ground for umpires, groundskeepers, park managers and other staff. The result? The DAP's renovation (since pegged at $5 million -- the remaining $1 million coming from interest earned on unspent bond funds) would allow the park to maintain its existing uses, as well as to become the home for NCCU's college baseball team,with MiLB operating the park under a contract with the City. We've been remiss in not acknowledging the good news that broke out of the Lakewood area late on Monday. As you've probably heard (and can read about in the H-S, N&O, or at Barry's place), the YMCA of the Triangle has struck an agreement with Durham County and the Durham Public Schools that preserves the future of the longtime neighborhood institution. The County approved the deal unanimously on Monday night; it moves to the school board in late May for that body's nod. In a nutshell, the county will spend $250,000 for the 60,000 sq. ft. facility -- a fraction of what the H-S reports is a $2.6-$4.5 million appraised value -- then spend $8 million to repair the old and battered facility. One-third of the space will be leased back to the Y for $1 per year; the Y will pay to make some final upfit renovations to their part facility, but the 15-year lease deal still is worth almost $2 million to the non-profit. The remainder of the old Y will be turned over by the county to DPS, which will operate a Montessori middle school in the space in less than four years' time. It's rare that you can call a deal a win-win (or, here, a win-win-win) and mean it as more than a cliche. But this is that really unusual case where the term applies. Monday marked the filing deadline for candidates in the upcoming election to declare their contributions received so far. The big fundraiser in the Board of County Commissioners race to date has been challenger Don Moffitt, followed closely by Ellen Reckhow and Becky Heron. Josh Parker also broke the five-figure mark. Fred Foster, Brenda Howerton and Doug Wright trail in contributions but have raised enough to cover the campaign basics. Joe Bowser and Victoria Peterson have raised little money and have each pledged to spend less than $3,000 on their campaigns. Not surprisingly, development interests represent a significant portion of donations to many campaigns -- to be expected, since land use is one of the key areas where governments have power over a business. (No one needs permission from the County Commission to open up a bakery in a strip mall or to hire new university faculty.) Still, the distribution and breakdown to individual campaigns are intriguing. Joe Bowser: No one I recognize -- and only two donors at that, plus a self-loan. Bowser's sole donors as of Feb. were the Rev. Bernie Bass and Thelma White. Bowser pledged to spend less than $3,000 on his campaign. Fred Foster, Jr: Local attorney Craigie Sanders is the campaign treasurer, with the $68.59 on hand as of January the only funds in Foster's donation bucket last cycle. This time around, Foster loaned himself $2,300 and Sanders loaned the campaign $1,602. Foster raised just over $500 from contributors this cycle; donors included East Durham activist Rev. Mel Whitley ($100), Lois Murphy, real estate agent Stephanie Gaither-Harris, and $25 from Diane Cattotti's re-election fund. Becky Heron: The long-time BOCC vet began the campaign with $6,100 in her account and added $13,445 in new contributions. Almost $5,600 of this came from a large number of folks contributing less than $50 apiece, a testament to Heron's long tenure and history in the community. Retirees make up a substantial portion of Heron's larger-dollar donors. Others contributing include Steve Schewel; Billy Olive (of the Olive and Olive law firm); Robert Teer, Jr.; Andy Widmark; Frank Ward; Mike Woodard; Barker French; George Beischer; David Harris; Gary Hock; James Tatum of Moore & Van Allen; Eugene Brown; Mary Semans; and Wade Penny. City Manager finalists forum: Three strikes, you're in? Monday night's City Manager finalists' forum was the public's opportunity to find out more about the three finalists for the most senior appointed position in Durham's city government. It was a forum for city employees, too -- and based on the questions from the audience, many of which dealt with employee accountability and department structures, seemed to come from that group. The City didn't choose to release the names of the three finalists until Monday morning. Still, in this Internet day and age, it didn't take the media or local bloggers -- including those from some of the finalists' previous cities -- long to discover that all three had resigned, apparently under pressure, from their last engagements. Naturally, the first reaction from Bull City watchers was likely a shared and collective groan. After all, experience is a prerequisite for the next city manager -- I doubt many folks hoped that experience would extend to the view a city manager sees on their way out the door. Still, as one of the candidates pointed out during the forum, the election cycle is as far ahead as most municipalities tend to look, and in council-manager forms of government, where the city manager is about the only position under elected officials' control, they're often the first to go. One candidate pointed out that the average tenure of a city manager anywhere is only 4-5 years, a period that matches two of the finalists' staying power. To my mind, a better question (and one which we can assume and hope the Council is asking of the Mercer Group) is whether this was a sufficiently deep pool to attract the right candidate for Durham. The Bull City search attracted 54 candidates, a far cry from the 120 that the Town of Chapel Hill drew two years back. And given that all three finalists in Durham's search are very recently separated from their last city, one wonders whether -- platitudes during the forum aside -- Durham is to these finalists an employer of opportunity, or an employer of choice. Does that mean there aren't good candidates in the pool here? Not necessarily: just that understanding the strengths and weaknesses of each during the references process seems more important than ever. The City Manager candidates just wrapped up their public forum/Q&A and are finishing up their media briefing. We'll have much more in the next few hours on the discussion from the evening. But in short: they say there's nothing like being there. And if you're interested in watching the forum, watch it online from the City's website (the link's currently down), or this Tuesday, Wednesday and Saturday at 2pm on Time Warner Cable channel 8. The candidates showed some interesting contrasts during the discussion, and it's worth watching. Recap and analysis to follow here soon. Speaking of public forums, we'll be interested to compare the turnout for tonight's City Manager search meeting against Tuesday night's update on the design process for the American Tobacco Trail's Phase E.
As we've talked about here before, Phase E includes the I-40 pedestrian crossing bridge as well as several miles of trail connecting the popular greenway from its current terminus at NC 54 to the Chatham County line. A November public meeting to gather community priorities and provide a background on bridge design concepts brought out over 110 participants, squeezed into the small committee room on the second floor of City Hall. Tuesday night's program moves to the much-larger first floor Council chambers. Expect a significant turnout to see the latest from Steven Grover, the Berkeley, Cal.-based consultants for what city leaders have called a "signature bridge" gateway over the I-40 corridor. We understand Grover's firm will present a selection of bridge concepts and designs, based presumably on the feedback from the triangulation survey that attendees were asked to complete at the last meeting. The outcome of the feedback from Tuesday's meeting will provide significant conceptual input to the final bridge design; the City is currently negotiating a contract with Parsons Brinkerhoff for the actual design itself. 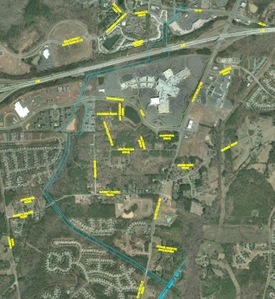 According to the City's web site on the project, notice to proceed on the design is scheduled for June 2008, with final design submittal set for March 2009. Assuming the project stays within the enlarged budget of $6.37 million (a cost that includes 4+ miles of trail as well as the bridge), the project would be let for construction bidding in June 2009 and would be expected to be completed by summer 2010. What's the City Council looking for in a new manager? According to their glossy recruiting brochure, a bachelors or masters degree in business or public administration, and ideally a professional credentialing in city management; five years of progressive experience at the assistant, deputy or chief city manager role (or "related experience"); experience in "infrastructure replacement" among other areas. Here's the real key: "Further, the Council is seeking a person ... who has developed and fostered effective relationships with their governing body and someone who has effectively developed and managed a large number of internal and external relationships." And, of course, being "open to input from the community." Being the manager of the City of Durham is not an easy post. Durham's neighborhoods and civic leaders are highly engaged and active in local government issues and have the ready ear of Council. A very good thing, and also an unusual one compared to many cities, where acute hearing loss tends to happen among elected officials a couple of months after elections. But it also means there are many more voices to listen to, and respond to -- and if you don't, you'll hear from citizen and Council alike. Last week we gave an overview of the Inter-Neighborhood Council's Board of County Commissioners candidates forum, and looked at two of the questions posed by INC members and the audience. Today: A wrap-up look at the last four questions posed to the nine BOCC hopefuls present last Tuesday night. Q: Are you in support of funding additional vocational education programs that exist in the community? Victoria Peterson: Yes, but she stated her support for such additional programs to be run by members of the community and local non-profits, not the government. Joe Bowser: Said it was hard to give a yes-or-no answer on the question. He stated that he generally supported the idea, but needed to know what programs in particular were proposed. "Government has failed with these programs and we have to look outside the government," Bowser noted. Doug Wright: Yes, for programs for which we can measure success. Don Moffitt: Stated that public/private partnerships are very important to make these programs work. Noted that it doesn’t matter to him who delivers them, but that they need to be measured both on how effective they are and how cost-efficient the programs are. Durham Committee aiming for big GOTV push? Over the past day, an intriguing rumor has started wending its way through the local political community -- one which could, if true, be of more than a little bit of interest for seven-tenths of the Board of County Commission candidates. We've heard from multiple sources that the Durham Committee on the Affairs of Black People -- whose ability to get-out-the-vote and gain support for their PAC's nominees -- is planning a massive, 35,000 home mailing targeting Durham's black community and containing the full slate of the DCABP's endorsements. If the Committee could pull this off, it'd be a startling show of vitality from the Durham institution, around the borders of which elected officials and elected-wannabes genuflect and tread carefully. And that "if" is part of the problem: the DCABP has made similar promises in the past, and hasn't followed through. Instead, community networks, churches, the local news and poll workers have been key carriers of the Committee's endorsements. Apparently gourmet pizzas are the flavor of the week in the local foodie community. First we had Scott Howell's announcement of The Rockwood Filling Station a few days ago. And now: the good folks at Pop's, who are opening the Pop's Backdoor takeout and delivery service today at 5pm. We learned about the new business from the Watts-Hillandale listserv; apparently a few residents in the neighborhood got a chance to try out Pop's-to-go over the last couple of weeks during its test-run period, and walked away with rave reviews of the new at-home dining option. The menu offers twenty choices of wood-fired pizzas/calzones, along with build-your-own with toppings that range from pepperoni and bell peppers to goat cheese, truffle oil, and shortribs. Fresh salads and breads as well as desserts (including tiramisu and chocolate pudding cake) are also available. Another plus: beer and wine are available for delivery/takeout, too, with your food order. Pop's Backdoor will be open 5pm until 10pm daily -- hours may extend until "11ish" on Fridays and Saturdays. Take a look at the first draft of the menu here: Download Pops-Backdoor.pdf.